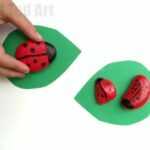 Both my kids adore digging around in the garden and exploring – finding ants and beetles and worms and bugs. 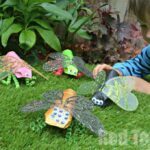 So I knew it wouldn’t be long before we HAD to make a simple Bug Hotel with them – the perfect Garden Craft for kids to get stuck into. 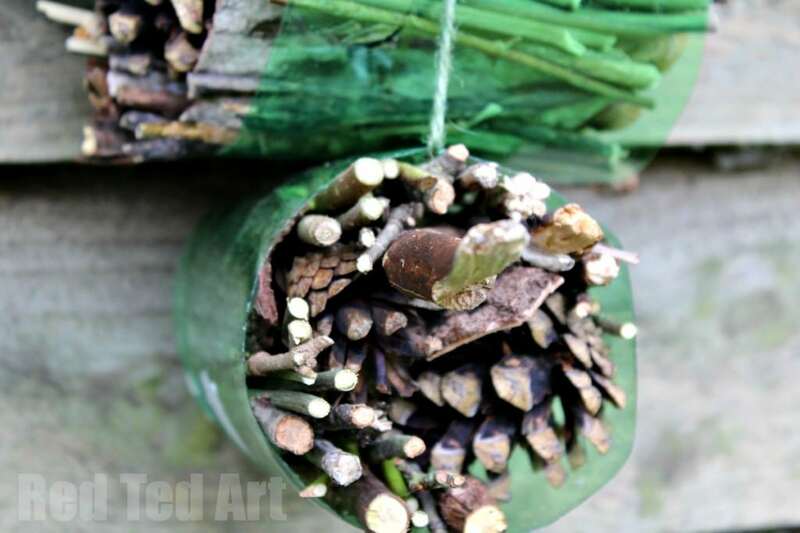 Our bug hotel is probably as simple and as easy as it gets – there are many prettier and cleverer bug hotels out there, but sometimes, you just have to make do with what you have and also make it easy for the kids to join in. 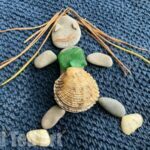 So we made ours with “local materials” and avoided any drilling or cutting tools. 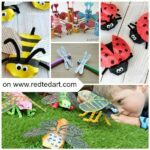 Perfect garden crafts for young children! We actually made this with Pip Squeak (3yrs), Red Ted (5yrs) AND the neighbour’s boy who is 8years. Loved that the different age groups enjoyed working on this together. 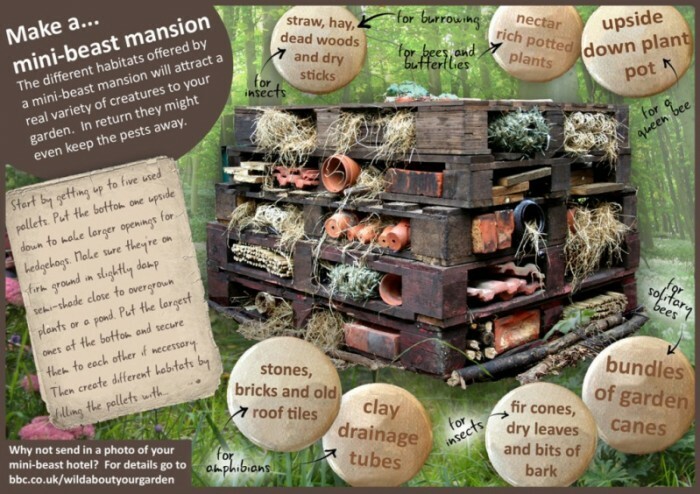 Note: this simple bug hotel first published in June 2013 – but updated and republished for your benefit! anything else you can find – bamboo with it’s holes is great too! We also had some broken plant pots but forgot all about them. Other bug hotels include other materials such as corn and drilled pieces of wood – to provide different nooks and crannies. I love the one from Garden Therapy. Have a look for inspiration. But in essence, I would say: “think natural”, “think nooks and crannies”, “think what will last” (e.g. paper could go soggy and leaves will go brittle and break/ disintegrate). 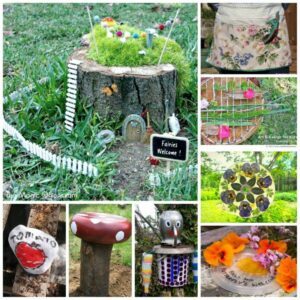 It is great to use things from YOUR local environment, as you are looking to attract bugs and beetles and insects from the same local environment. 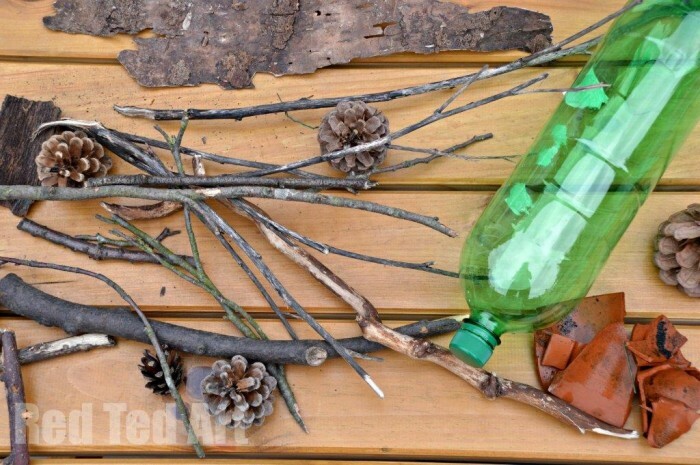 2) Check what materials you have and arrange by size and texture – we snapped our twigs to make them a little smaller. Had larger and bigger ones. Arranged pinecones. 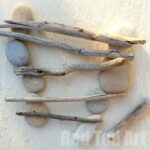 3) If you plan to hang your bug hotel, loop some garden twine round and then start layering your bug hotel. We did one hotel for on the ground and one for hanging from a tree to see if would attract different creatures. 4) Stuff it to make it nice and firm, so it doesn’t get blown about! 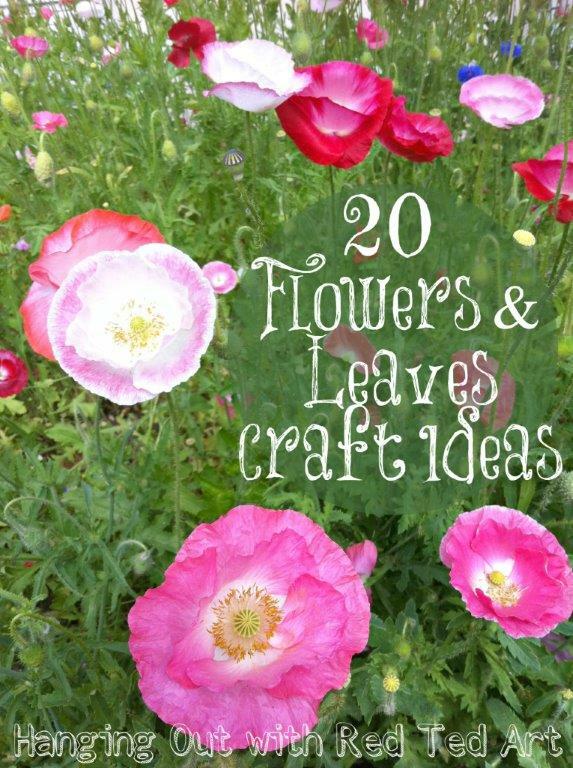 Each week, I would like to feature a craft from a friendly blogger linking up the week before. 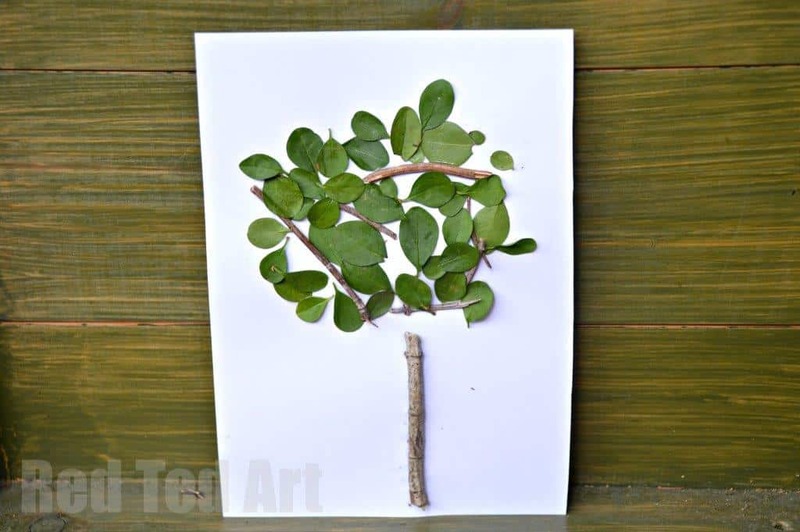 Hope you like our garden activity for kids. 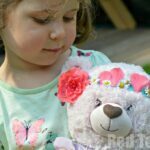 It is a great way to get outside, rummage around, get closer to your immediate environment and make something fabulous with the kids. 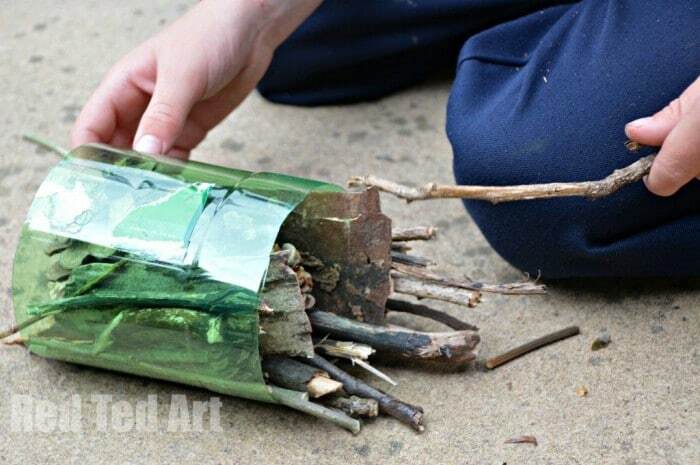 We do love a nice Garden Craft that kids can join in with!! Awe hopefully he will, bugs are so cool! wow.. I am a bit too squeamish about bugs but it does look a really cool idea! As long as the bugs are outside…. you are ok! I love this Maggy 🙂 and you made it seem so easy! It WAS easy, promise!! Drinking all that water to get the bottle empty, wasn’t…. Pleasure, thank you for linking up! This is very cool! I think I know a boy who would love to make one of these. We made our bug hotel a couple of years ago now and it’s still in use. Just poke some more leaves and things in there as a top up. Kids love it! Ooh great to hear! Will be interesting how long my kids stay interested?! Thank you for the double pin! Much appreciated. My kids would love this. I’ll have to make sure my son doesn’t see the BBC bug hotel photo otherwise he’ll want an enormous hotel too. *Snigger* good point!!! DO NOT SHOW THE BIG HOTEL!!! My girls love digging for bugs. We recently finished our Insect unit and our Butterfly unit, but they are still loving to go outside and find bugs. I think they will love this idea. Thanks for sharing such a cute project once again. And thanks for the linky. I linked up my O is for Octopus/Ocean post. My children will love this. They are bug mad! I love bug hotels. So much incredible discovery. Truly they are going to love it. 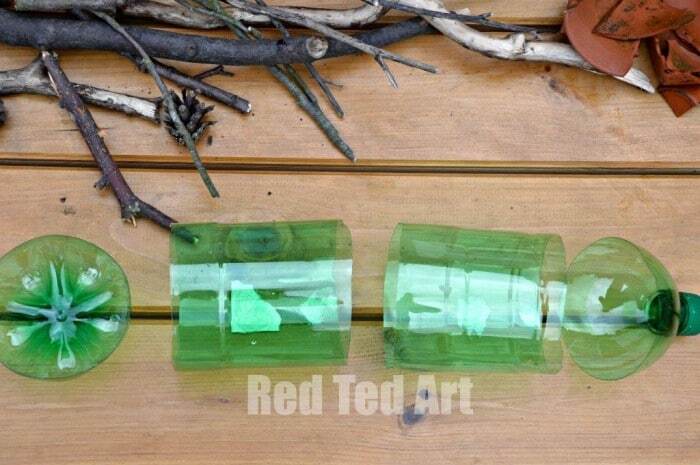 And I really like how you recycled an old bottle. That BBC one is pretty awesome. Imagine the creepies that would move into that!! Think i’m gonna have a go at making one of these myself, i’ve always got a water bottle hanging around the house. Brilliant thankyou ! Just had my whole class of Year 1s make these 😀 they loved it and they look fab! What a great idea! Hello! My 2nd grade summer reading camp class read this article for a non-fiction comparing activity! They thought the idea of a bug hotel was awesome. Thank you for posting this online. Oh wow! That makes me so happy! Many thanks.